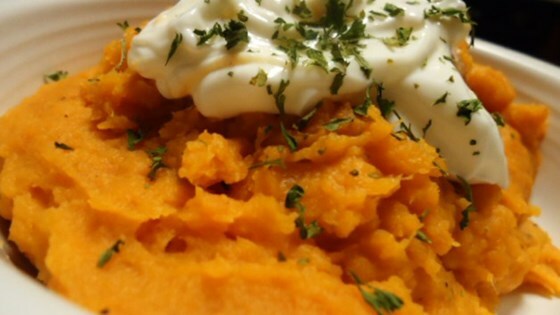 "Simple mashed sweet potatoes flavored with maple syrup and butter." With an electric mixer on low, blend potatoes, slowly adding milk, about 1/2 a cup at a time. Use more or less to achieve desired texture. Add butter and maple syrup to taste. Blend until smooth. Serve warm. Nice complement to pecan breaded chicken made from this site. Makes girls like me more. Which is peculiar since my charming personality should be enough. My husband couldn't stop raving about these. I added a bit of cloves and cinnamon as well. Perfect sidedish for a fall meal! I roast my potatoes whole in the oven then peel the skin after they cool a little. The flavor is much better than with them boiled.